Many people disapprove of stray-feeding because “it encourages strays to breed”. Theoretically, giving these dogs food keeps them alive, and provides them with opportunities to breed. However, withholding food from these street dogs is by no means a way to curb their population. Even hungry dogs can propagate, and their newborn puppies often go hungry as their mommies hardly have enough food for themselves, let alone milk to nurse them. Some people might think that letting the dogs starve to death would be a good way to prevent the dogs from breeding. No doubt, it is a way. But is it the most humane way to control the stray population? What we, from Second Chance suggests, is to sterilize strays. Spaying prevents the strays from further multiplying. 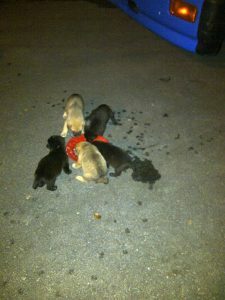 Gradually, the stray population will reduce as the strays who have been spayed are not able to reproduce more puppies. As a matter of fact, feeding is a great way to assist in making this spaying activity a success. The “Spay It Forward” program as carried out by HOPE Dog Rescue requires the dogs to be familiar with the volunteers and hence they will develop enough trust for the volunteers to approach them such that we are able to bring them to our vets, be it for sterilization or for injuries sustained from industrial accidents or dog fights. Without this trust, it would be difficult for any spaying program to reach the strays. Again, under HOPE Dog Rescue, volunteers also get to know the dogs well through regular feeding rounds. This allows and eases them in keeping track of the stray population in various industrial areas, as well as any new pups who are eligible for sterilization. This way, they can sterilize them before they reach breeding age. As such, their feeding and sterilization programs go hand in hand. This is a more organized and humane way of preventing breeding, rather than simply withholding food from stray dogs. This way, they can live their lives as strays in marginally increased comfort without more unwanted pregnancies. These dogs may not be pedigrees, but they deserve the right to live as much as you and me. Another reason people commonly give for not feeding strays that is that “it attracts vermin”. The rationale behind this is that when you leave food for strays, you are also feeding pests such as rats and cockroaches with the leftovers. To a certain extent, this may be true. However, it must be reminded that the strays that live in the industrial areas often have no proper source of food apart from what is given to them by animal activists and animal shelter volunteers. If they are not fed, these dogs would be so desperate for food that they would devour bones, rubbish, stale food, and even stones. They would be so famished that they’ll resort to eating stones! Needless to say, they’ll await the weekly visits made by volunteers with much anticipation, and every morsel is ravenously gobbled down. In other words, there’s simply nothing left for pests! That is why nourishing the strays might not be such a bad idea after all. Truth is, they have no cushy homes to find solace in. They don’t have anyone to love them like we do. And they don’t have anyone to bring them to the vet when they’re sick or in pain. With all this in mind, we can’t bear to let them go without food as well, or to watch them die a slow and agonizing death without doing anything to help. Simply put, our goal is to reduce and manage the stray population by sterilizing them, while allowing the remaining dogs to live a better life for the rest of their days. Would you like to help us give these innocent, hungry-loving animals a chance to live? Their lives are hard enough, and it’s only right we give them a little kindness. A little kindness goes a long way, and it would mean the world to them. If you would like to sponsor food for these street and factory dogs, please email info@2ndchance-kennel.com. The most precious gift you can give is the gift of love. Please take note that this article was originally written by Elena Lin of HOPE Dog Rescue. Original article may be obtained HERE. Thanks a mil to HOPE Dog Rescue (Singapore) for giving us permission for re-blogging this informative article.